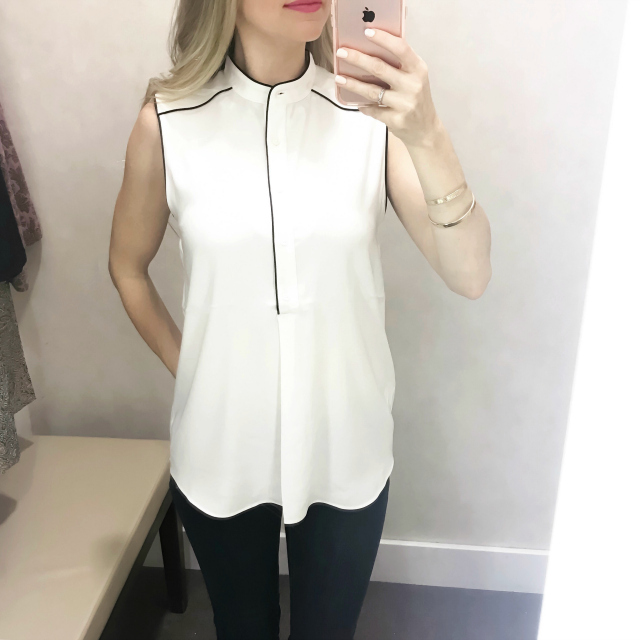 Today I'm sharing some quick Ann Taylor fitting room reviews with you since I recently had the opportunity to pop into the store and try several new goodies on. I'm breaking up the reviews into two parts to keep them short and sweet. Lots of pretty eye candy, as usual! You all know my love for AT by now, so I was excited to get my hands on some of the pieces I had spotted online as well as others I had completely overlooked. No code is needed in-store; the discount will be applied automatically at checkout. 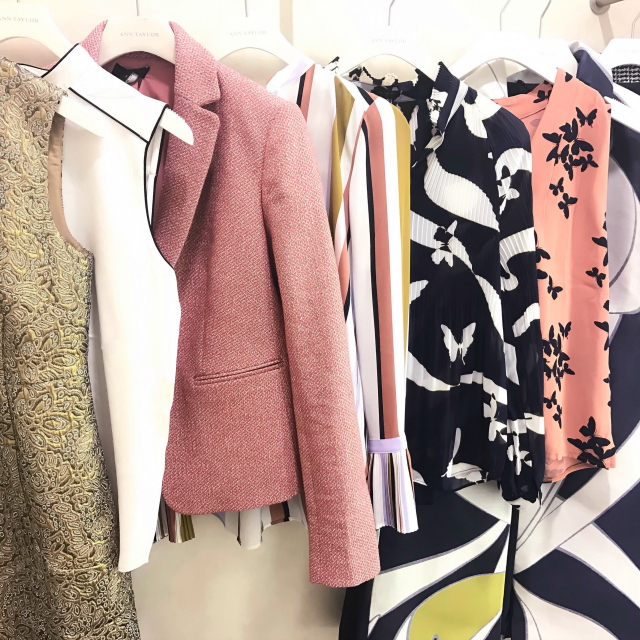 This is one of the deepest discounts I've seen offered on Ann Taylor's sale items, so you don't want to miss out on your favorite pieces at amazing prices! You can start shopping the sale here. Now, let's jump right into the fitting room reviews! First up is this Tweed Single-Button Jacket in "faded rouge." 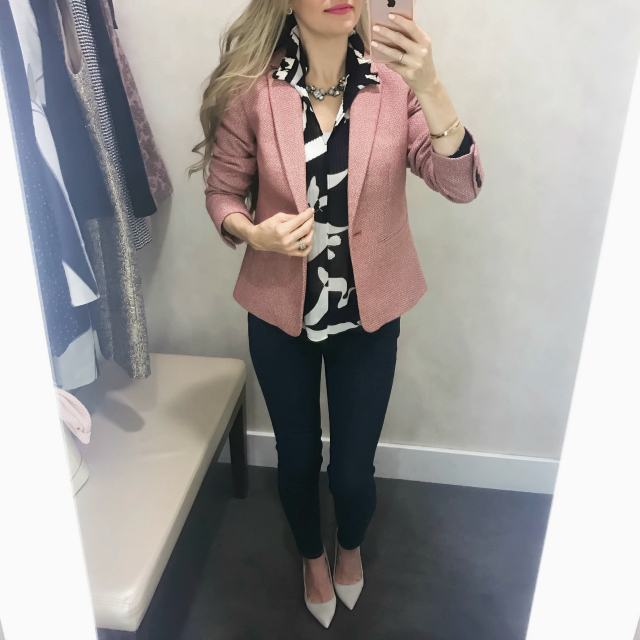 Surprise, surprise - I'm immediately drawn to the only blush blazer in the store. (lol) But, in my defense, the color of this tweed blazer is so lovely in-person, it just begs to be tried on. 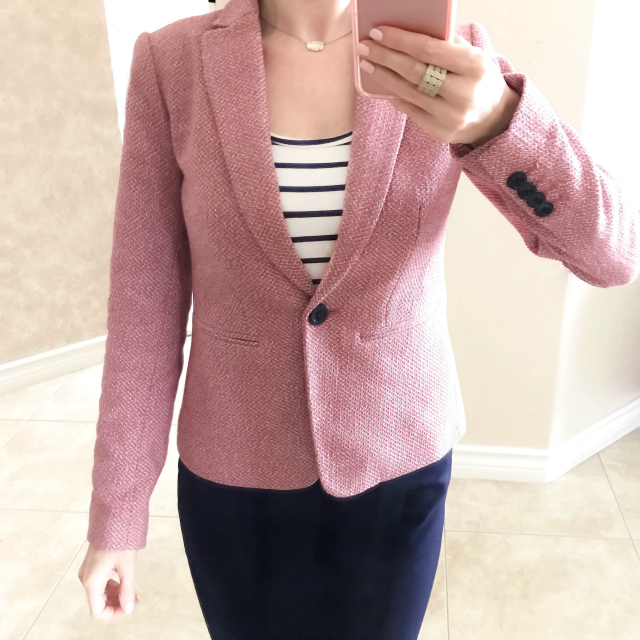 The color is much nicer than the previous season's textured blazer (I'll try to find a picture for comparison), which was quite similar but had a darker, almost-mauve shade. The previous season's version also consisted of a sturdy cotton blend, which was more stiff as I recall; whereas, this one is a cotton-poly blend with 2% elastane, which adds a nice hint of stretch. It's fully lined and soft to the touch -- not scratchy or itchy at all -- making it super comfortable and easy to move in. This blazer is offered in both regular and petite sizes. I tried on size 2, which was the smallest size available on the floor, and it was a bit too large on me. The sleeves were too wide and were bothering me, so I scrunched them up for a better fit. I ordered size 00P in store with the help of a sales associate, and it should arrive soon. I'll better assess the fit at that time*, but didn't want to wait too long since the petite sizes always seem to sell out the fastest. For reference, the regular size is 22" long and the petite size is 21" long. 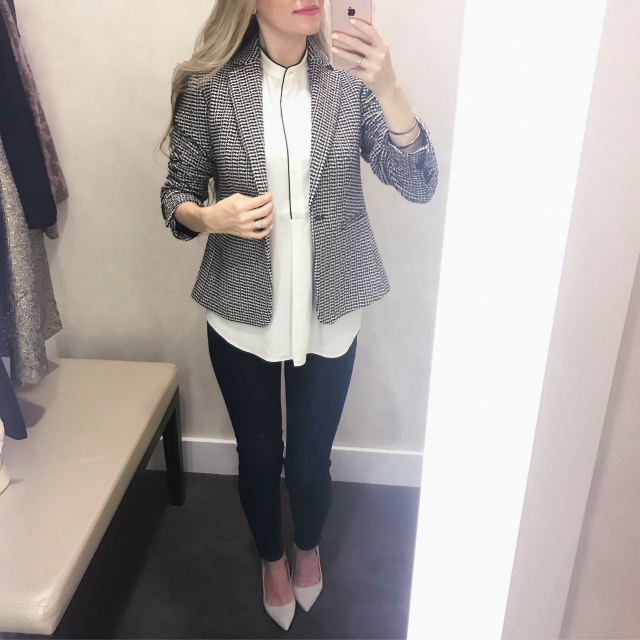 Overall, this is a darling blazer with a classic fit/cut that is perfect year-round, especially moving into Spring and Summer. Love it and highly recommend it! *Update (1/18): Size 00P arrived in the mail, and it fits perfectly. It has a much closer fit but still allows ample room for layering, which is exactly what I prefer. I'm including a couple of updated pictures below to serve as a fit reference. Verdict: Love it and definitely keeping! The blouse feels like a light, airy chiffon and is semi-sheer. You'll want to add a cami for more coverage. 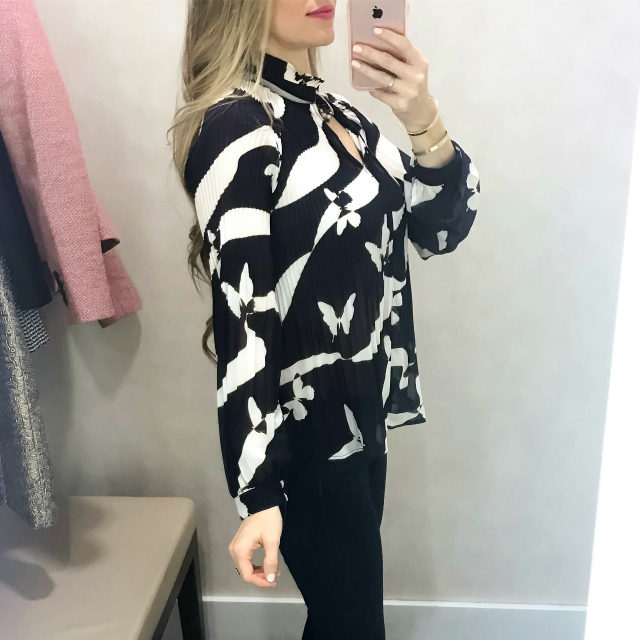 What makes this top unique, apart from the print, is the very fine (micro) pleating on the upper body and upper sleeves; it's a very feminine and flattering detail, allowing the blouse to drape nicely. It's still flowy but not overwhelmingly so. It also has a ruffled collar and shirred sleeve cuffs -- more pretty details that make it special. Seeing this online, I probably wouldn't think much of it, but after seeing it in-person, I think it's lovely. It can be dressed up with a pencil or flare skirt for the office, or dressed down with jeans as I'm wearing here. This blouse is offered in both regular and petite sizes. 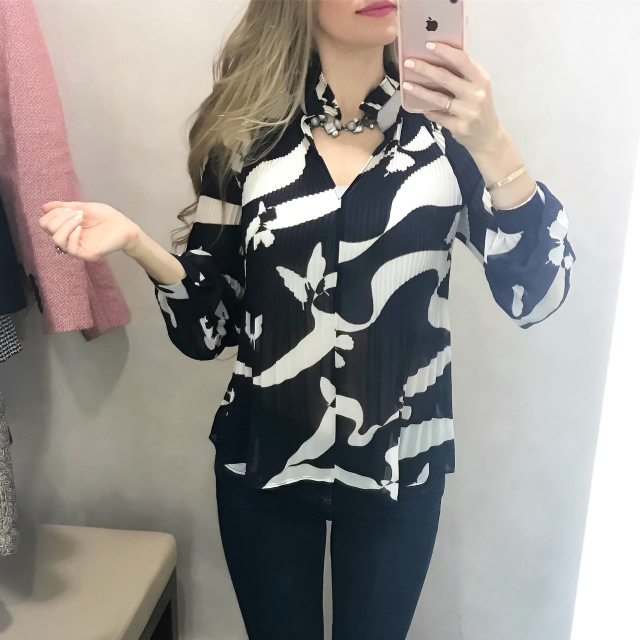 I tried on size XXSP, which is what I usually take in this style of blouse at AT, and it fits nicely on my 5'2" frame, so I'd say it runs true-to-size. For reference, the regular size is 26.5" long and the petite size is 25.5." It's 100% polyester and machine-washable. If you like this style, but prefer a more understated print, try the Butterfly Micro Pleat Blouse. It's the exact same blouse in a navy color with small, taupe-colored butterflies that almost resemble polka dots. So cute! Whichever you prefer, both of these lightweight blouses will be ideal for Spring/Summer. Next up is this Calla Lily Jacquard Coat in "blue multi." This is a dressy coat with a luxe, silky feel. Pictures don't do it justice, really. It's very sleek and the pattern is quite striking in-person. 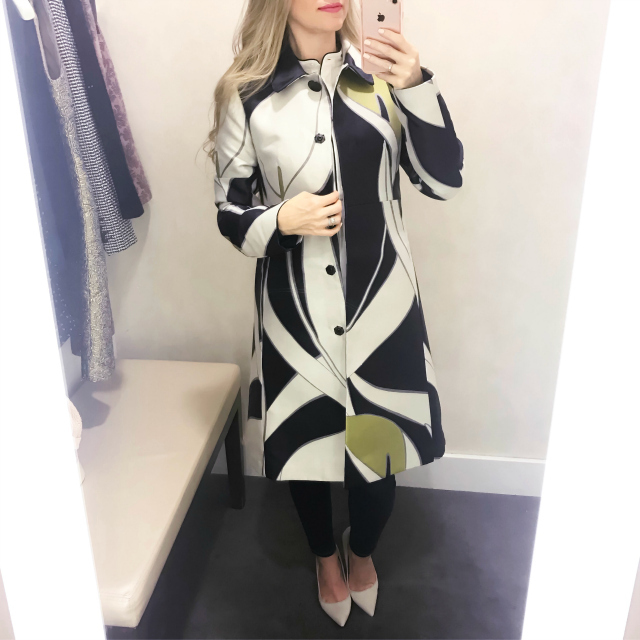 I normally gravitate towards solid-colored coats, but the colors and print of this one grabbed my attention and I had to try it on. The mix of navy, cream, and chartreuse colors are beautiful, and the abstract print is really unique and lovely -- clearly one of the themes in this collection that I noted earlier. In the photo, the coat is open, but there are hidden snaps down the front that give it a clean, streamlined look when closed. It also has side-seam pockets that blend nicely into the overall aesthetic. It's beautifully tailored and well-made. It's a polyester-rayon blend and dry-clean only. Petite sizes were unavailable to try at my store, but this coat comes in both regular and petite sizing online and in select stores. I'm trying on a size 2 regular, which is too large and long on me. Even so, it's an amazing coat. If you're similar in size to me, I would suggest a size XXSP or XSP for the ideal fit, depending on the thickness of layers you plan to wear with it. For reference, the regular size is 37" long and the petite size is 35" long. The good news is that the petite sizes for this coat are not online-exclusive, so you can track them down and try them on in a store near you. Overall, it's a gorgeous coat, and will no doubt garner lots of compliments! Next up is this Piped Sleeveless Blouse in "winter white." This is a nice, classic shell that will serve as a versatile piece in any wardrobe. It has a drapey fit without looking frumpy or too boxy, and the mandarin collar is a nice detail. I also love the contrast piping; it's very classic-chic, and would look lovely under a cropped cardigan or blazer or on its own with dark skinny jeans as shown here. Pieces that can easily go from the office to dinner/drinks are always my favorite and see plenty of use. This same blouse also comes in several color/print options: a black one with white piping here, an intricate daisy floral print in a coral-peachy color here, and a sky-blue color with navy polka dots here. If you like this contrast-piping style but prefer sleeves for more coverage, try the Piped Tie-Neck Blouse, which comes in the same "winter white" color as well as a "rich citron" color (a mustard/chartreuse blend) here, and a "light slate blue" color (a sky-blue/grey blend) here. The first two colors are offered in both regular and petite sizing, and the last color is only offered in the regular sizing. All blouses in this style are 100% polyester and machine-washable. I'm trying on a size XS here since no petite sizes were available at my store in this style, but both regular and petite sizing options are offered online. If you prefer a longer length, the regular size is the way to go; if you want a more cropped fit, the petite size will work best. For reference, the regular size for all of these blouses (sleeveless and long-sleeved) is 27" long and the petite size is 25.5" long. Overall, it's a great wardrobe staple that can easily be mixed and matched for multiple stylish, dressy and casual outfits alike. Next up is this Herringbone Blazer in a black and white color. Unfortunately, it appears to be sold out online, which I didn't realize until after I left the store. It's a classic, single-button style blazer in a tweed-like material and is fully lined. I paired it here with the piped blouse above, and I like that it has endless styling possibilities in that it can be dressed up or dressed down with a simple switch of blouses or sweaters. It would serve as another wardrobe staple for those of you on the hunt for a nice-fitting, timeless blazer. You can try locating it in-store by calling AT's customer service line. The style number is 417948, which is the petite sizing option. After searching online, I believe the style number for the regular sizing option is 417948. I'm trying on a size 2P here, which runs a bit large, so if you are similar in size to me, you might try a size 0P or 00P depending on how you plan to layer it. To close out Part 1 of these reviews, this is the Striped Pleated Cuff Blouse in "skysail blue." The color description is confusing, as this blouse is actually a combination of lilac, mauve, chartreuse, cream, and navy. The colorful stripes are fun and whimsical, but the real stars are the micro-pleated bell sleeves. They're adorable! They add just the right amount of drama and flair, don't you think? They're a modern, tasteful take on the beloved bell-sleeve trend that's everywhere right now. It's another one of those pieces that I probably would have brushed over online, but after seeing it in-person, I had to try it on, and I'm so glad I did because it's really quite darling! And it can be paired with a host of pretty colors thanks to the multi-colored stripes, giving you tons of styling options. Another noteworthy detail is the mandarin collar: it's feminine and modest. This blouse is 100% polyester, but because of the micro pleating on the sleeves, I would definitely suggest dry cleaning to be on the safe side. I'm trying on size XXSP, which fits nicely. I also appreciate that the buttons don't pull or gape at the bust. Both regular and petite sizing are offered for this blouse, and for reference the length of the regular size is 26 1/4" long and the petite size is 25" long. 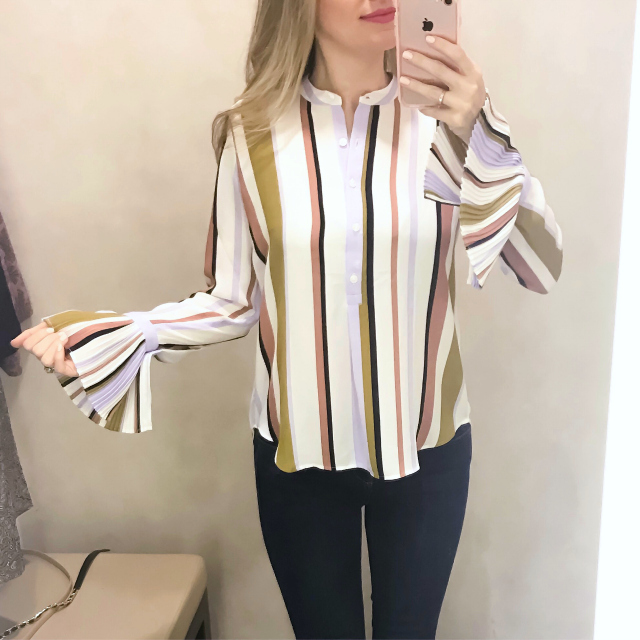 The stripes and bell sleeves may not be everyone's cup of tea, but it's fun to occasionally step out of your comfort zone and try new things. I say try it and see what you think. You may be pleasantly surprised! If you're still not sold on the stripes, you might try the Butterfly Pleated Cuff Blouse. It's the exact same blouse in an abstract butterfly print in shades of navy, cream, chartreuse, and blush. That concludes Part 1 of my fitting room reviews. I hope you found them helpful! Stay tuned for Part 2 coming soon! Have a wonderful evening, and thanks so much for stopping by! Hi Sara! 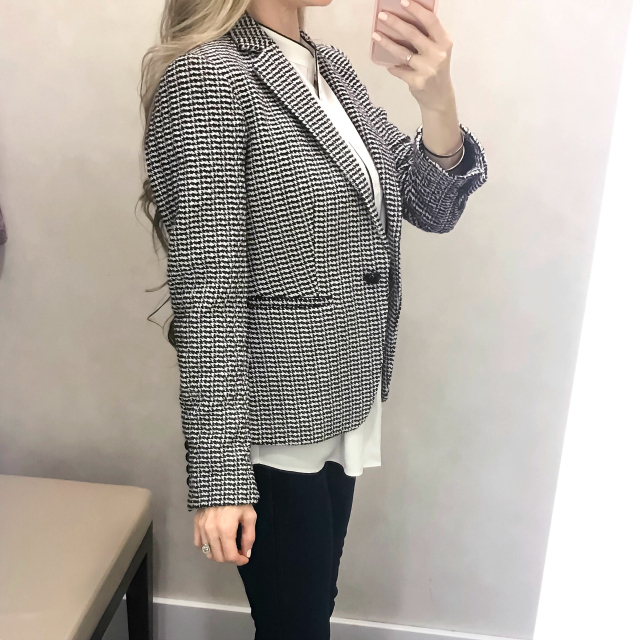 Thank you so much for posting a review for Tweed Single Button Jacket from Ann Taylor. 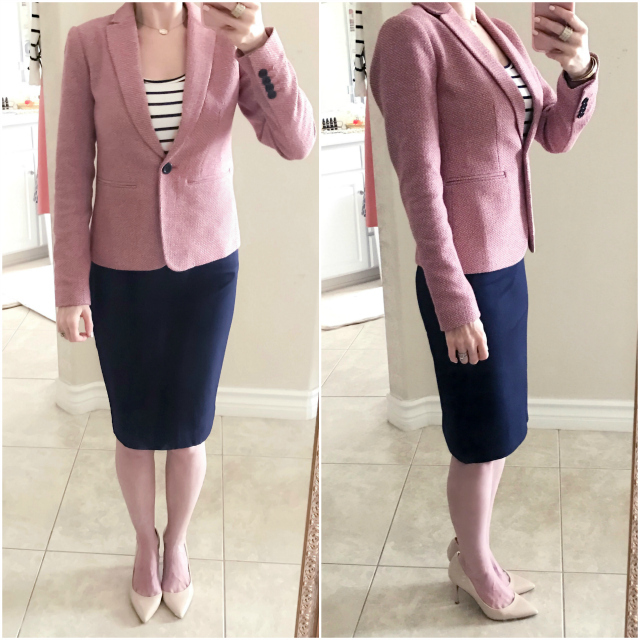 I fell in love with this jacket when I saw it online, but I wanted to read a review first before purchasing it. After reading your review, I decided to buy a size 2 instead of a size 4. I'm so glad I came across your blog...Thanks again! Hi Jenn! You are very welcome! I'm so happy to hear that you found the review helpful! The Tweed Single-Button Jacket continues to be one of my wardrobe favorites, and I hope you end up loving yours just as much as I do. Thank you so much for taking the time to read my post and to leave such a kind comment -- I truly appreciate it!